Julia discusses Babe’s childhood and family. Julia talks about how generous Babe was with others. Julia talks about how Babe Ruth got his nickname. Julia talks about Babe’s fondness for Brother Mathias at St. Mary’s Industrial School, where Babe grew up. 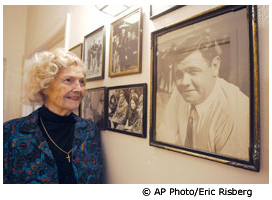 Julia talks about some of details of her trip around the world that she took with Babe Ruth and Claire during the 1934 barnstorming baseball tour of Asia.